Grave Digger are one of the few bands who became more successful after their comeback. Founded already back in 1980, they released three albums in the mid-Eighties, but somehow never could achieve the status of the then more fashionable thrash bands Kreator, Destruction and Sodom. The early Nineties had a better climate for their brand of hard hitting heavy metal, so vocalist Chris Boltendahl reunited new musicians to start a second time, with more success as their albums regularly hit the German album charts. Ballads Of A Hangman is already their thirteenth album, and although you shouldn’t expect anything new, this is the first time the band in their nearly thirty year long history that they have two guitarists on boards. Both used to play in renowned speed metal bands (Rage, Risk) which should be a good enough argument for a thunderstorm of high quality riffs. Otherwise Grave Digger have let go the high-brow concepts that marked most of their previous albums. Instead they have a more old-school approach this time: the songs are mostly short, fast, crunchy, and their single Pray which concludes the CD is even a soon-to-be classic. Only Lonely The Innocent Dies shows the band from a moodier side. Chris Boltendahl is joined by Veronica Freeman of American metal band Benedictum on this six minute epic that somehow doesn’t want to fit into the overall very rootsy atmosphere of the album. I can’t claim ever to have been a huge fan of Grave Digger, but Boltendahl’s persistence deserves respect. The more basic approach guarantees them a sound which shows them fresher than in the past. 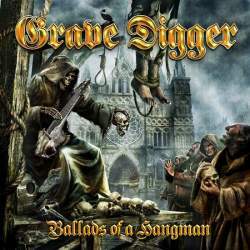 Ballads Of A Hangman is another excellent addition to Grave Digger’s discography, although once you subtract the intro and the not so successful semi-ballad, you’re left with – only – nine songs that will entertain any true metal fan to the max!